The global ethylene propylene diene monomer (EPDM) market has been foreseen by Transparency Market Research (TMR) to exhibit a significant level of consolidation. However, the consolidated nature of the market could mellow down as a vast count of companies consider ventures, also intensifying the degree of competition. The industry could also be influenced by mergers and acquisitions and high focus on less developed markets for favorable growth prospects. The Dow Chemical Company, Lion Copolymer LLC, Mitsui Chemicals, LANXESS AG, Kumho Polychem, and ExxonMobil Chemical Company have been marked as the top six players securing a colossal share of approximately 80.0% in the world market. According to TMR, the global EPDM market has been foretold to draw a revenue valuation of US$4.20 bn by 2024 at a CAGR of 5.4% from the opening year of the forecast period. In 2015, the market is analyzed to have raked in a US$2.63 bn. By end-user analysis, the automotive sector could take a leading position in the international market until 2024 as it had accounted for a more than 40.0% share in 2015. Holding a similar share in the same year as that of the automotive market, Asia Pacific has been envisioned to dominate other regions during the forecast period. The changing preference from traditional to bio-based products and a substantial surge in demand from the automotive and construction sectors have been expected to propel the growth of the global EPDM market. With a breakneck influx of small as well as medium-sized firms in the market, a host of new opportunities could take birth as the competition becomes more aggressive. An impressive number of EPDM manufacturers have been anticipated to extend their reach to emerging nations where the demand for private and public automobiles and construction projects are experiencing a perpetual rise. Electrical and plastics (polymer modification) are the other sectors that could give some momentum to the growth of the global EPDM market. The significant demand for thermoplastic vulcanizates (TPV) and thermoplastic olefins (TPO) in a range of sectors such as consumer goods, medical devices, packaging, and construction has been predicted to bode well for the market. In the coming years, vendors could expect lucrative growth opportunities from the thermoplastic modification industry. The more than required supply of EPDM due to humungous capacity additions by top companies such as Mitsui Chemicals and LANXESS after the late economic depression could impede the growth of the global EPDM market. This could also add pricing pressures on currently operating industry players. Other than that, raw material cost fluctuations have been projected to discourage the demand in the market. 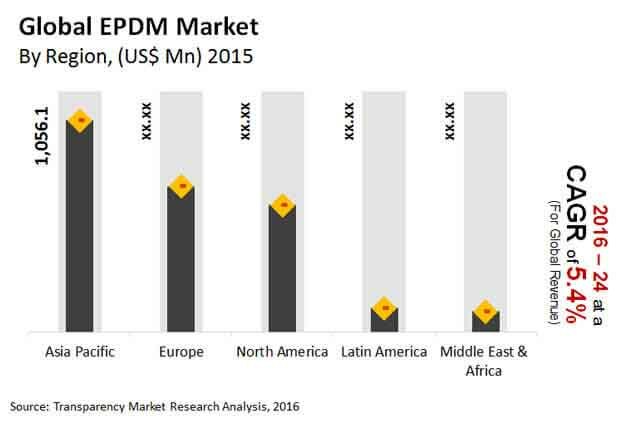 Nonetheless, the EPDM market is the one which finds expansive growth prospects in developing regions such as Asia Pacific and Latin America as opposed to the common scenario of developed regions taking the charge. As the international market loses its consolidated nature, new entrants have been envisaged to be exposed to sustainable growth opportunities birthed in the process. More growth opportunities could take precedence as the demand for EPDM rubbers increases in the booming automotive sector. South Korea, Thailand, India, and China have been studied to be the major consumers of EPDM.